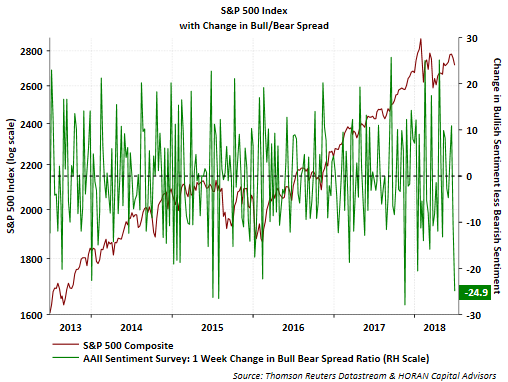 On Thursday the American Association of Individual Investors reported results from the weekly Sentiment Survey and sentiment swung decisively bearish. As noted in the past, the sentiment surveys are contrarian indicators and high levels of bearishness and/or low levels of bullishness can signal equity market turning points. Yesterday's report saw the bull/bear spread swing 24.9 percentage points, the fourth largest swing to bearishness in the last five years. 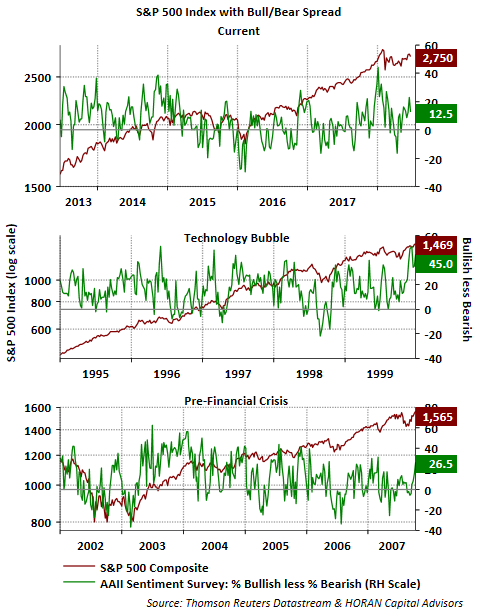 Not long ago I was ask to compare current sentiment data provided by the American Association of Individual Investors with the market sentiment levels reached near the peak of the technology bubble. Going a little further, below is a chart showing the individual investor Bull/Bear Spread near or going into the peak of the technology bubble and the peak reached just prior to the financial crisis. 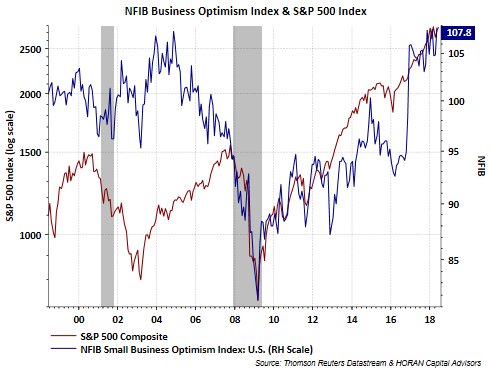 Last week I noted the NFIB Small Business Optimism Index reached the second highest level in its 45 year history. 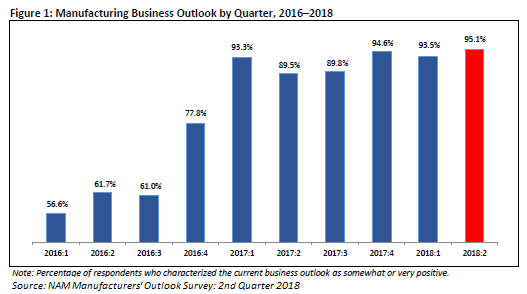 As a follow on, the National Association of Manufacturers released their Second Quarter Outlook Survey today and reported manufacturers' optimism registered 95.1%, the highest level ever recorded in the 20-year old survey. Much of what has been discussed on financial news networks over the course of the past several days has centered on tariffs and the escalation into a potentially larger trade war. This is the type of negative news that the media enjoys pounding into its readers and listeners. Of course one should not put their head in the sand about potential consequences of an all out trade war, which we believe will not unfold though. To date the amount of product being impacted is just .25% of our economy. Adding some balance to the tariff discussion and the broader impact to the markets would be helpful. The one outcome I heard repeated today is the Dow Jones Index return is now slightly negative for the year. What about some of the broader indices though? 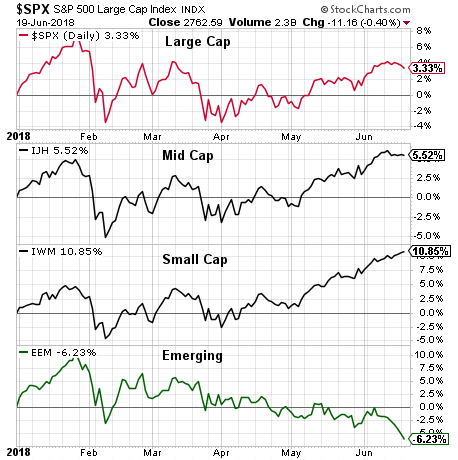 Below is a year to date chart showing the return of several indices and ETF's that represent the S&P 500 Index, the S&P Midcap Index (IJH), the S&P Small Cap Index (IWM) and the MSCI Emerging Markets Index (EEM). Clearly, all is not bleak. The small cap index is up 10.85% this year through the close on 6/19/2018. The nearly half year return for midcap stocks is a respectable 5.52% and the S&P 500 Index remains up 3.33%. Emerging markets have been the weak link and partially due to the tightening monetary policy in the U.S which I discuss a little later. Writing blog commentary serves as a permanent record of one's thoughts at a specific point in time. When reflecting back on earlier posts, expectations and conclusions do not always unfold in the market or economy as anticipated and written about at that time. The benefit is one can adjust future thinking and conclusions if necessary. Sometimes events occur that one simply could not anticipate and the events result in a change of direction in the market. All investors would benefit in tracking how they arrived at their investment decisions.. It seems over the last few weeks there has been much written about the outperformance of growth stocks versus value stocks. The extended outperformance of growth over value has pushed the relative valuation to a high for the growth style and a low for the value style and was referenced with a chart in the June monthly presentation by State Street Global Advisors. The below chart is a slightly different version but shows the higher relative valuation of large cap growth versus large cap value at this point in time. "On each occasion that the unemployment rate sank beneath 4%… recession was soon on tap. To remind, it now rests at 3.8%. But why should recession rapidly follow peak employment?" 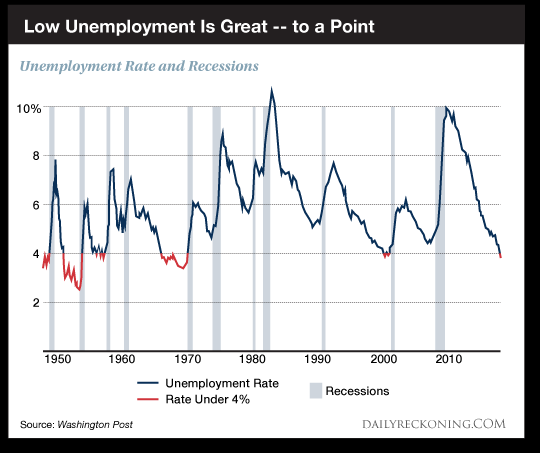 The article included the below chart and provided several reasons that would seem to justify the fact a recession is near when the unemployment rate is below 4%. Often times these scary or miracle charts are highlighted in an attempt to scare investors out of the market. 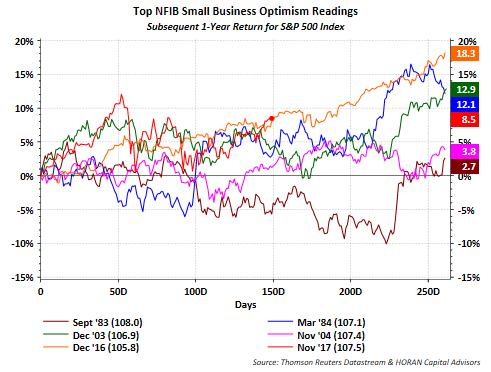 As regular readers of this blog know, from time to time I opine on investor sentiment whether it is the AAII Sentiment Survey, the Investor Intelligence Advisors' Sentiment report or the NAAIM Exposure Index. At the moment, suffice to say that these 'investor' sentiment reports are neither overly bullish or overly bearish and conclusions drawn from them are most useful when the data are at extremes. 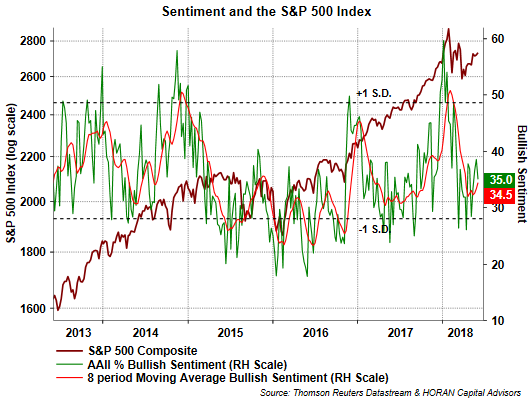 Below is a chart of last week's bullish reading from the AAII Sentiment Survey and its current reading falls between + and - the one standard deviation levels.